Mohandas Karamchand Gandhi, also known as Mahatma Gandhi, was born on October 2, 1869. He dedicated his life to struggling for the independence of India from the British Empire. Unlike independence leaders in most of the countries, Gandhi chose the route of non-violence. His philosophy, satyagraha, was a theory and practice within civil resistance. The birthday of Mahatma Gandhi is marked with commemorative ceremonies and solemn services held all over the country. The main ceremony takes place at Raj Gad, a memorial to Gandhi located in Delhi. During the ceremony, people pray and sing Gandhi's favorite devotional song Raghupati Raghava Raja Ram. On the occasion of the holiday, schools and communities organize essay and painting competitions. All works submitted are dedicated to peace and non-violence as the main values promoted by Gandhi. 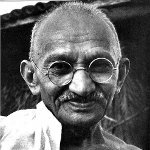 In 2007, the United Nations General Assembly recognized Gandhi's achievements by designating his birth anniversary as the International Day of Non-Violence.